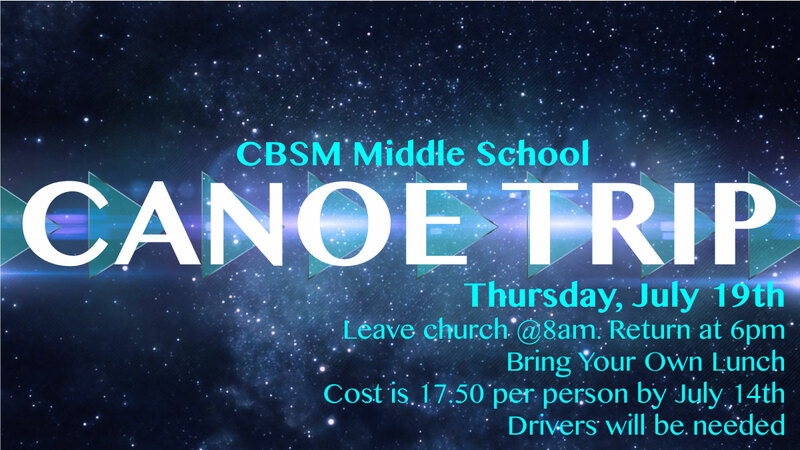 CBSM Middle School is going canoeing this Thursday, July 19 at the Buffalo River in Waynesboro, TN. Meet at the CBSM Building at 8:30am. We’ll be back around 4:30pm. You need to make sure you’ve paid your $17.50, bring your own lunch, and turn in the medical release form. If you’re still interested, we can take more. Bring your money this Wednesday, but you’ll need to make sure you have your own ride. Contact Mrs. Penny Fowler for any additional questions or info.